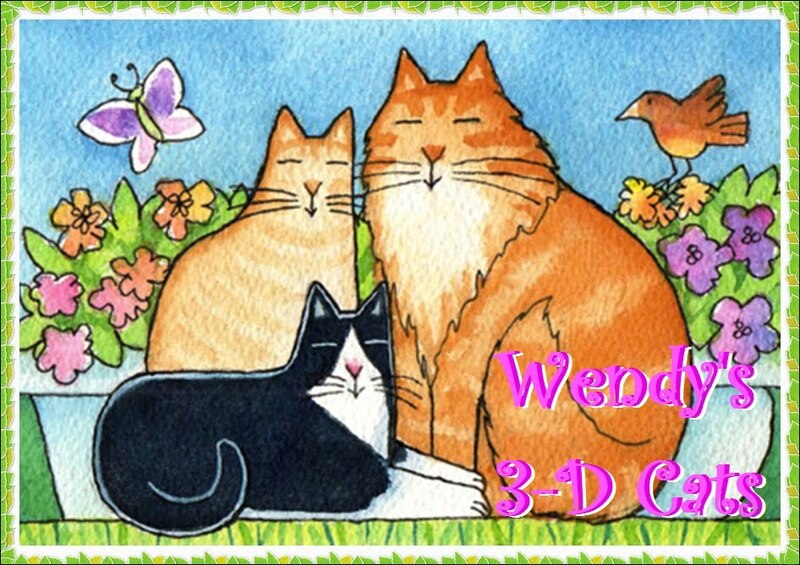 Wendy's 3-D Cats: STRAW HATS IN 3-D! Straw hats on Domino, Dylan and Dante, that is! For best viewing, please biggify. In this case, the bigger, the better! 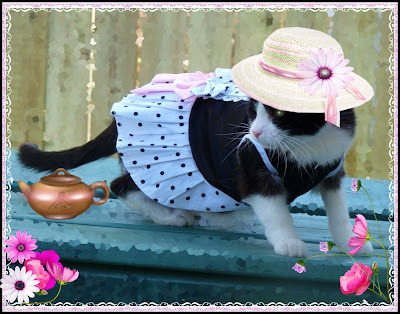 Domino is looking very hot in her pink straw hat adorned with a flower from the garden, and her polka-dot tea party dress. You could say she's "dressed to the TEAs". She says "Come on over for a cuppa while it's hot." Milo better come quick before everything simmers down. 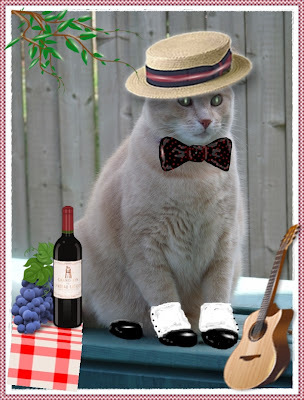 Dylan is all dressed up in his straw boater hat, bowtie and spats. He's all ready for some WINE, WOMANCAT and SONG. WOO who! Who you ask? Why, his beautiful girlfuriend Halle, of course! Dante is wearing his straw cowboy hat in high style. He's been busy rustling up some grub. "I think I'll barbecue me up some mouse-ke-BOBS", says he. "What do you think about that, Bob?" "I'm not a cow", says Bob. And that, my friends, is the last straw! You all sure looking mighty straw-hat fine! Great collection of hats - they were of course modelled by such a pretty lady and two handsome mancats. They all look good, but Dylan's ensemble is hysterical! My goodness, everyone looks wonderful! Domino so pretty, and Dylan...Well, he'll make Halle's heart beat at triple-time! And that cowboy hat just seems to suit Dante to a "T". Oh goodness, all of you look terrific in your straw hats. Dante, your straw hat is so great. And Domino, you sure look good in that pretty dress. At least you keep yours on. Dylan, look at those fancy shoes you have. You three are all decked out. Take care. 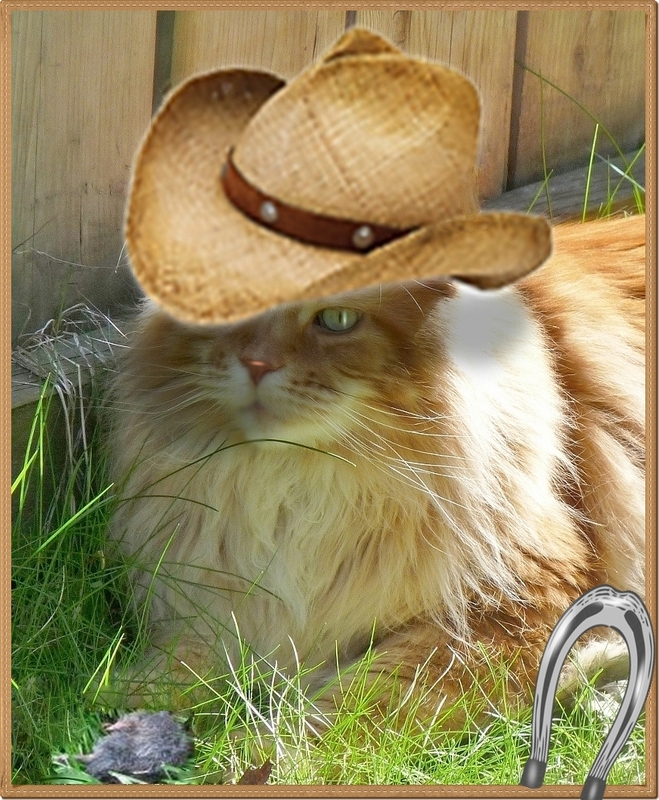 Wow you kitties look fantastic!!! Each of your hats suits you so well. Pretty dapper or pretty and dapper but I prefer the cowboy! You look great in your straw hats!! 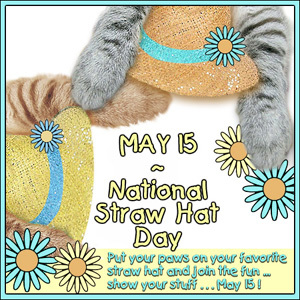 Happy Straw Hat Day!!! Whoo! Hoo! Yous all looks so good (Domino, yous wears that dress so well!) but me lives in cowboy country and Dylan, what a dream boat! 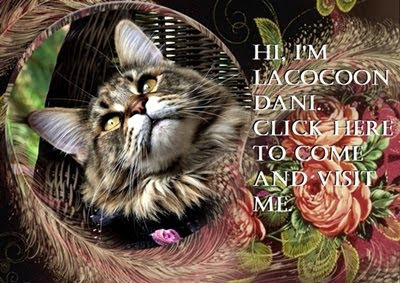 Dommy ~ I am on my way over 'cos yoo look so beautiful! WOW! I love all those hats! OMC! Great straw hats and very complimentary outfits to go with them!